I’m heading up to DCLX this weekend, but before I abandon the blog for another dance weekend (you understand, right?) I’ll leave you with these two dresses. Red with green, green with red, but the real detail here is the contrast – most dresses try to match buttons, but I love these solid dresses with contrasting buttons. It really makes the buttons pop and becomes even more of a decorative detail than a functional necessity. This is definitely something I’d like to see more of (paging ModCloth, Anthropologie, Trashy Diva…). 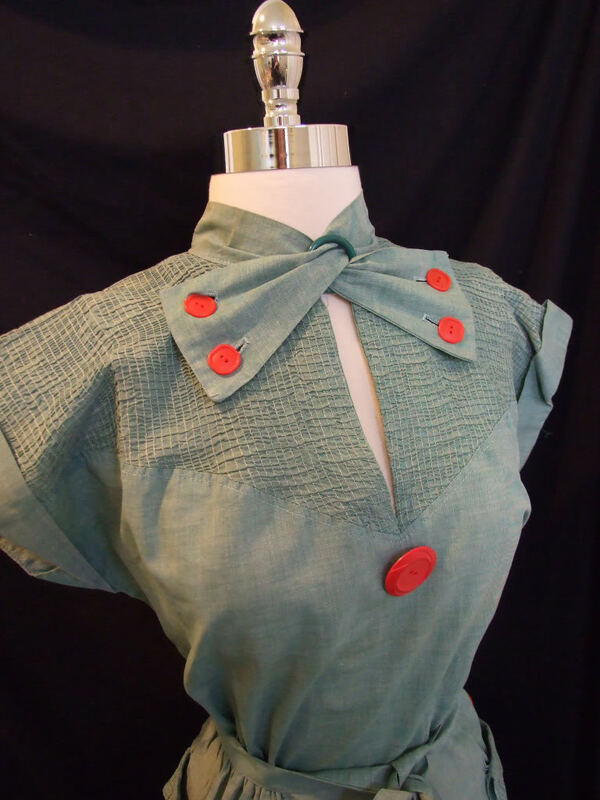 Further, check out the neck detail on the green dress – it’s two dresses in one, with a keyhole neckline or a v-neckline. So in love…I was definitely one of the losing bidders on this auction. This entry was posted in 1930's, 1940's, Dresses and tagged 1930's, 1940's, Balboa, buttons, contrast, dresses, eBay, Lindy Hop, swing dancing. Bookmark the permalink.